would suit athletically minded adolescents, teens or adults. and features a velcro attachment to provide a custom fit. meanwhile, fits waist circumferences of 20 to 32 inches. Both types of cases hold two epinephrine auto-injectors. living with multiple life-threatening medical conditions. Omaxcare® is all about the active kid, teen and adult. 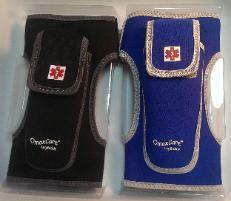 Their options are waste bands style and leg band style. could brake and puncture a child by accident. fall, or get pushed while playing with friends.